Sometimes when you travel you have the greatest luck, and the timing of our arrival in Hoi An, a picturesque town about halfway between Saigon and Hanoi on the Vietnamese coast, was one of those moments. We had cut short our stay in Nha Trang, a kind of Vietnamese Rimini, all big seafood restaurants and happy families playing on the beach, and set off north along the perilous coast road where the scenery is only slightly more breathtaking than the hairpin bends and sheer drops to the crashing sea below. The journey, as with most journeys in Vietnam, took longer than expected and we pulled into Hoi An just as the sun was setting and the streets were filling up for the monthly full-moon festival. Throughout much of south-east Asia, the full moon is the chance for a good street party. (How often, I wondered, do we even notice it in the west?) But Hoi An does it particularly well. As we strolled down from our hotel, children gleefully squeezed past us carrying tiny paper lanterns and dressed for their role in one of the huge Chinese dragons that were already assembling by the riverbank. This is a festival of light and on every corner stalls sold torches, candles, lanterns and, in a very Asian gesture to modernity, little hand-held fibre-optic lamps that scrolled automatically through the colours of the rainbow. Down on the river, flat-bottomed boats, covered in candles, ferried people to a brightly lit city of food stalls on the other side. And everything, of course, took place under the wonderfully crispy light of the moon itself. 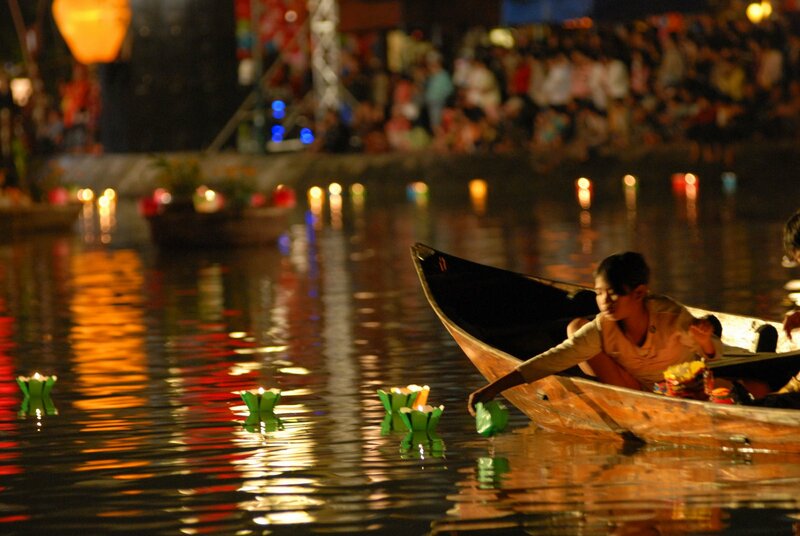 Hoi An is one of Vietnam’s great survivors. Barely touched by the “American war”, it was for 300 years an important international trading post. From the 17th century to the beginning of the 20th, it was visited by merchants from China and Japan, India and the Philippines, Spain, the Netherlands, Britain, Portugal and the New World. Chinese merchants would sail down in the spring and take up residence in the town waiting for the winds to turn and take them back home again. They traded silk, paper, porcelain, tea, sugar, molassesÃ¢ * whatever the country produced and their ships could carry, and the houses they built – open, airy wooden structures that you can see right through from one street to the next – still make up much of the old town. Nowadays, though, they are more likely to be home to a smart little cafe or a gallery of modern Vietnamese art. After the motorised madness of Saigon or Hanoi, it’s a relief to find yourself in a walkable town. Most of the old streets are car free, though you can still come face to face with an absurdly overladen motorbike down the narrowest of alleys. And in half a day you can stroll round pagodas, tombs, theatres, museums and temples, with plenty of the Chinese’s favourite “Fat Buddha” statues on display. There is also a charming covered bridge, built by the Japanese and guarded at one end by a pair of stone monkeys and at the other by two stone dogs. Hoi An is an excellent foodie destination. One morning, we spent a couple of hours on a Vietnamese cooking course at the Red Bridge restaurant, about 2km down-river (it’s served by a small shuttle boat). Set among lush, tropical forest, the Red Bridge is surprisingly chic, modern and understated – three words that don’t come up that often in Vietnam. We made Hoi An pancakes, prawn spring rolls, aubergine stuffed with vegetables, squid salad served with half a pineapple (apparently authentic, but much too sweet and Hawaiian for my taste) and, the most fun, rice paper for the shrimp rolls. We also made some fruit and vegetable carvings. Almost any meal in Vietnam will come with at least one rose, fan or bird of paradise carved from a tomato, cucumber or carrot. These garnishes are simple, elegant and, as we discovered at the Red Bridge, phenomenally difficult to make. The restaurant’s assistant chef made what seemed to be just a couple of slices into a tomato and produced a chrysanthemum. When we tried to copy him, we ended up with a vegetable that had been at the wrong end of a slasher attack. Luckily this wasn’t one of those cookery courses where you are actually expected to learn anything and once the casualties had been cleared away, we sat down at a table by the river and tucked into everything we had made, plus a fine steamed fish rustled up by the professionals, before catching the boat back to town. Until its river silted up at the beginning of the 20th century, Hoi An used to be a sea port, and 5km east of the town are some fine stretches of white-sanded beach. At weekends these get very busy – one day we stumbled upon a wonderful kite festival there – but during the week you can often have the place almost to yourself. I say almost because Hoi An’s beaches have been taken over by a tribe of android-like women, all clutching large trays and selling exactly the same goods – from mango slices to nail clippers. They also refuse to take no for an answer and, while their command of English is not deep, what they do know would impress a brush salesman. A simple “No thanks” elicits a “Why not?”. “Not now” produces a “Maybe later?”. “Maybe later” leads to a “When exactly?”. And, express an interest in the goods one woman is carrying, and four or five others will ask you indignantly why you are not buying from them. For a more natural, and calmer, beach experience, it is worth hiring a taxi and visiting Marble Mountains, about 20km to the north. The mountains themselves (more like hills, really, unless you come from the Netherlands) are indeed made of marble and are riddled with caves that over the centuries have been turned into first Hindu and then Buddhist sanctuaries. There is a route of sorts, but it’s worth abandoning it if you can (take a torch and sensible shoes) if only to lose the crowds. Nearby China Beach is wide, long, rugged and satisfyingly deserted. But be careful in the sea as the undertow can be vicious. Back in town, the other big activity is shopping. There is a good smattering of art and antique shops, but the big draw is the made-to-measure tailors that line almost every road in the new town. We spent our money on wood carvings instead, but as we were leaving town, the bus was full of travellers with spanking new clothes bags. The Chinese merchants may have gone back home, but Hoi An’s crafts are still being exported the world over.